In the continual pursuit of designing, engineering, and manufacturing the ultimate performance upgrades, our original TSE2 has been discontinued for a significant re-design, resulting in the TSE3. The all-new TSE3 is the absolute best performance exhaust system for '00-'04 330, 328, 325 and 323 models (i, Ci, iT - not for Xi). It continues the fundamental design of TSE2 as a full dual cat-back design, however the TSE3 is unique in the use of exclusive RSC (Reflective Sound Cancellation) technology that is capable of targeting and modulating specific sound frequencies. The result of this technology is a drone-free exhaust system, delivering a pleasant sound at idle and cruise and a muscular roar at high rpm. Test vehicles for this development program included the 330i Steptronic, whose transmission programming "lugs" the engine at low rpm, resulting in a high potential for drone. The TSE3 is tuned specifically to counter that situation and the results are impressive. Reflective Sound-Cancellation™ (RSC™) - a non-electrical noise control system without the complication of incorporating the use of electronics or speakers. Essentially, engine sound (pressure) waves are reflected in passages inside the muffler to cancel out unwanted sound waves. The result is a "tuned" muffler that "cleans up" the noise without eliminating the pure sound of power associated with a high-performance vehicle. Using this technology, the stainless steel RSC mufflers are tuned to eliminate passenger cabin resonance and produce just the "right" sound. . 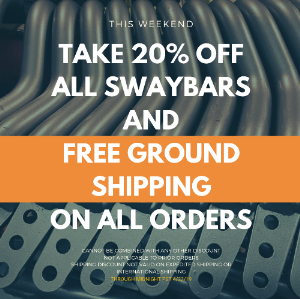 The RSC muffler design does not use conventional packing materials, and provides a totally un-restrictive exhaust flow for maximum power output. The TSE3 is fully emissions-legal in all 50 states. Construction enhancements include 100% mandrel-bent pipes, TIG-welded seams, and true bolt-on installation (no cutting or welding required). Many statutory bodies around the world currently mandate that vehicles comply with stationary exhaust noise tests specifications - Generally based upon the "SAE J1169 Measurement of Light Vehicle Exhaust Sound Level under Stationary Conditions". California and various other states now have legislation that makes exceeding this limit an offense, resulting in a "fix it" ticket and required testing certification. TSE3 has been certified to meet the SAE J1169 sound test for 95dB noise limits. The test involves positioning a type 1, SIA compliant ANSI S1.4 - 1983 noise level meter, specifically as illustrated in the diagram below. Positioning is relevant, the tests are extremely specific in their scope and must be conducted under controlled conditions. Dyno results for the TSE3 show useful increases in mid-range torque and high-end horsepower. 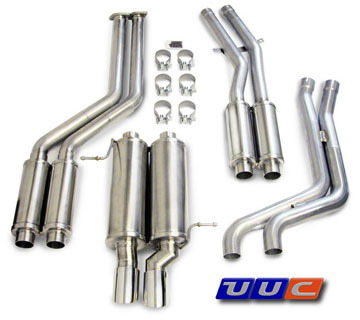 UUC offered the very first exhaust system for the all 330 / 328 / 325 / 323 models featuring two completely separate exhaust paths for optimum flow and awesome sound. On 328 and 323 models, the car is converted to a true dual exhaust system like the 330 and 325. The basic BMW design of the exhaust manifold and catalytic converters does a really great job muffling all the sound coming out of the motor. But who wants to drive around in an electric golf cart? Other aftermarket exhausts for the E46 3-series are simply rear muffler sections which leave both restrictive sound-deadening and power-robbing resonators in place. Unfortunately for owners of these cars, the result is little more sound than stock, and very little performance gain. The result is power you can feel and a sound that will make you smile. weight savings: the UUC TSE3 is substantially. lighter than the original exhaust section removed. extra ground clearance: got a lowered car that scrapes the muffler on the ground? The TSE3's silencers sit higher than stock. extra tire clearance: planning on fitting super-wide 255 or even 265 tires? The TSE3 silencers do not intrude into the wheel opening. From Charlie K. of West Greenwich, Rhode Island on 6/2/2014 . From Antonio of NYC, New York on 5/9/2014 . From Xavi of Taampa, Florida on 2/25/2013 . From Shane S. of Austin, Texas on 6/23/2012 . From Tory Smith of Owings Mills, Maryland on 5/24/2007 . Construction: 100% 304 stainless steel (including interior parts), all welded. Design: Complete cat-back exhaust, dual conversion. Tips: dual round 3", angle-cut and staggered, double-walled. Sound: Deep and mellow, "screams" at high rpm.